Objectives: To study the ictal phenomenology, aetiology, and outcome of convulsions occurring within seconds of impact in violent collision sport. Design: Retrospective identification of convulsions associated with concussive brain injury from case records from medical officers of football clubs over a 15 year period. Subjects: Elite Australian rules and rugby league footballers. Main outcome measures: Neuroimaging studies, electroencephalography, neuropsychological test data, and statistics on performance in matches to determine presence of structural or functional brain injury. Clinical follow up and electroencephalography for evidence of epilepsy. Results: Twenty two cases of concussive convulsions were identified with four events documented on television videotape. Convulsions began within 2 seconds of impact and comprised an initial period of tonic stiffening followed by myoclonic jerks of all limbs lasting up to 150 seconds. Some asymmetry in the convulsive manifestations was common, and recovery of consciousness was rapid. No structural or permanent brain injury was present on clinical assessment, neuropsychological testing, or neuroimaging studies. All players returned to elite competition within two weeks of the incident. Epilepsy did not develop in any player over a mean (range) follow up of 3.5 (1-13) years. Conclusions: These concussive or impact convulsions are probably a non-epileptic phenomenon, somewhat akin to convulsive syncope. The mechanism may be a transient traumatic functional decerebration. In concussive convulsions the outcome is universally good, antiepileptic treatment is not indicated, and prolonged absence from sport is unwarranted. Convulsions that occur within seconds of impact are an infrequent accompaniment of traumatic brain injury. Their occurrence in collision sports such as football and rugby creates public drama and management challenges for the treating clinicians. It has been widely assumed that these events represent a form of post-traumatic epileptic seizure (“impact seizure”), secondary to underlying brain injury, with all the medical and psychosocial consequences of epilepsy.1 2 Large epidemiological studies of post-traumatic epilepsy describe early (within one week) and late (after one week) seizures after traumatic brain injury.1 2 3 Both types of seizures have been shown to have an epileptic basis. In contrast, convulsions within seconds of head injury have not been well studied and certainly have not emerged as a risk factor for post-traumatic epilepsy in studies of severe head injury.4 We studied these concussive convulsions in Australian footballers to determine if there was evidence that these were epileptic in origin and if they were associated with lasting brain injury. These findings have implications for management of patients and, in the case of professional sportsmen, major implications for career and lifestyle. We retrospectively identified convulsions associated with concussive brain injury from case records of all club medical officers in elite Australian rules football competition over a 15 year period. The league is a national football competition, and in the 15 year period about 200 000 player games occurred. Twenty episodes of concussive convulsions were identified, and all cases were followed up. This probably represents total ascertainment of cases because of the dramatic nature of the episodes concerned. We also included two additional cases of concussive convulsions that occurred in elite rugby league during the time frame of the study. In all 22 cases eyewitness accounts of the episodes were obtained from medical officers. In four of the 22 cases, television videotape of sufficient quality was available for detailed analysis of the event. These cases allowed the detailed ictal phenomenology of the convulsive episodes to be determined. The routine management after concussion in Australian rules football entails clinical and brief neuropsychological assessment. This assessment includes questions of memory, orientation, digit symbol substitution test (from the Wechsler adult intelligence scale), and choice reaction time. These measures have been found to be sensitive markers of mild traumatic brain injury in football.5 6 7 The concussed player's results are then compared with his preseason baseline assessment. Seventeen players were followed up in the period after injury by serial clinical and neuropsychological testing. All players in the study were followed up clinically. In all cases, neuroimaging data and the original electroencephalographic records were sought from the treating neurologists and neurosurgeons. The 22 identified episodes occurred in footballers aged 19-30 years (mean 23.4 years). Case report–A 24 year old footballer was struck on the left side of the face by an opponent's elbow during a collision (fig 1 (left)). As he fell towards the ground loss of consciousness was apparent, and he developed tonic arm posturing with both clenched fists in a “bear hug” position (fig 1 (centre)). His legs were extended and his head and eyes were turned to the right. After 20 seconds of tonic posturing, a series of generalised symmetrical myoclonic jerks occurred for 30 seconds (fig 1 (right)). His loss of consciousness was 2 minutes, and he had 45 minutes of post-traumatic amnesia. Results of subsequent neurological examination, electroencephalography, and cerebral magnetic resonance imaging studies were normal. He returned to football the following week without further effects and has continued his football career for a further six years without problem. Table 1 shows separate analyses of all 22 eyewitness accounts and of the four videotaped cases. Typically, after a violent collision the player lost consciousness and started convulsive movements within 2 seconds of impact. The mean (range) time to onset in the video cases was 0.75 seconds (range 0-2.0 seconds). The convulsion usually entailed a brief tonic phase followed by bilateral myoclonic jerking. Asymmetrical posturing and versive head movements were seen in all video cases but recalled less often (31%) by the eyewitness accounts. The episodes ceased spontaneously within 150 seconds, and the players woke with behavioural and neuropsychological features indistinguishable from mild concussion. Of particular interest were two footballers who were alert and orientated within seconds of the termination of the convulsive event. Both cases were documented on videotape. The first of these was an Australian rules footballer whose convulsive event lasted 150 seconds; he then woke up on the stretcher as he was being carried off the ground. The second was a rugby league player in an international test match who sustained an event in the opening minute of the game. After recovery he returned to the field and performed sufficiently well to be voted “man of the match.” In both cases, clinical and neuropsychological assessment after injury yielded normal results, and both players returned to sport the following week without problem. The mechanism of injury, as determined by the site of impact, was a direct facial blow in all four videotaped cases. Eyewitness reports in the 18 other cases suggested that around half were facial blows, a quarter were occipital, and the remainder were uncertain. All players had either computed tomographic (10 cases) or magnetic resonance (12 cases) brain imaging, which yielded normal results. Twenty one players underwent electroencephalography after injury, which yielded normal results with the exception of one, who demonstrated transient left temporal slowing in the immediate period after injury. Follow up electroencephalograms performed at one week and 24 months on that player have had normal results. The outcome for players with these events was universally good. All players returned to participation in elite sport within two weeks of the episode without effects. Results of serial neuropsychological tests performed on 17 Australian football players returned to baseline level within five days after injury (table 2). This is the typical pattern after concussive brain injury seen in this sport.5 6 Match statistics did not reveal any significant difference in the match performance of injured players before and after injury (table 3). Post-hoc analysis of individual players' performance did not show any significant deterioration that might have been concealed in the group statistics. The mean (range) length of follow up was 3.5 (2 to 13) years. No player has gone on to develop epilepsy, and seven of the 21 players have had further concussive episodes without convulsions. If we assume complete ascertainment of concussive convulsions, these occurred 1 per 10 000 (20 out of 200 000) player games in elite Australian rules football. Concussion is known to occur at a rate of 1 per 10 player games,8 10 so concussive convulsions occur once in every 1000 concussions in this sport. Concussive convulsions described here in violent collision sport are an uncommon but dramatic association with minor head injury that have been recognised since the time of Gowers.11 12 Our video study showed that these concussive convulsions occurred within 2 s of impact. Moreover, they were not associated with structural brain injury or with ongoing epilepsy or epileptiform electroencephalographic abnormalities and had a universally good outcome. Thus they are unlikely to be epileptic in nature, and other pathophysiological mechanisms need to be explored. From a phenomenological standpoint, concussive convulsions have more in common with convulsive syncope than with post-traumatic epilepsy. Convulsive syncope is a non-epileptic phenomenon thought to reflect a loss of cortical inhibition coupled with reflex brainstem activation.13 14 Clinical and video-electroencephalographic analyses have demonstrated a spectrum of convulsive movements ranging from focal myoclonic jerks in mild cases to generalised tonic-clonic events that resemble true epileptic seizures.14 15 16 17 18 19 20 21 In many cases, lateralising features are prominent. The episodes are usually brief, typically lasting for only a few seconds, and occur after a delay of less than 10 seconds. Unlike convulsive syncope, concussive convulsions can last up to 150 seconds and start with a latency of 2.0 seconds or less, making a reflex cerebral ischaemic basis unlikely. Another hypothesis, and the one we favour, is that the concussive impact itself creates a transient functional decerebration akin to the corticomedullary dissociation described above. In the players suffering concussive convulsions, the universally good outcome and absence of structural injury or long term neuropsychological damage reflects the benign nature of these episodes. From a management standpoint, late seizures do not occur, antiepileptic treatment is not indicated, and prohibition from collision sport is unwarranted. If an episode follows the profile outlined above the treating clinician can reassure the patient that concussive convulsions are benign, and overall management should centre on the appropriate treatment of the concussive injury itself. We thank Channel 7 Melbourne for provision of TV videotape; the members of the Australian Football League Medical Officers Association; Drs David Maddocks, John B Stephenson, and Graeme Jackson for their cooperation with this study. Funding: PRM is supported by the National Health and Medical Research Council (NHMRC) and the National Sport Research Program of the Australian Sports Commission.
. Epilepsy after non missile head injuries. 2nd ed. London: Heineman, 1975.
. Traumatic epilepsy after closed head injury. J Neurol Neurosurg Psychiatry 1954;17:1–10).
. Seizures after head trauma: a population study. Neurology 1980;30:683–9). eds. The late effects of head injury. 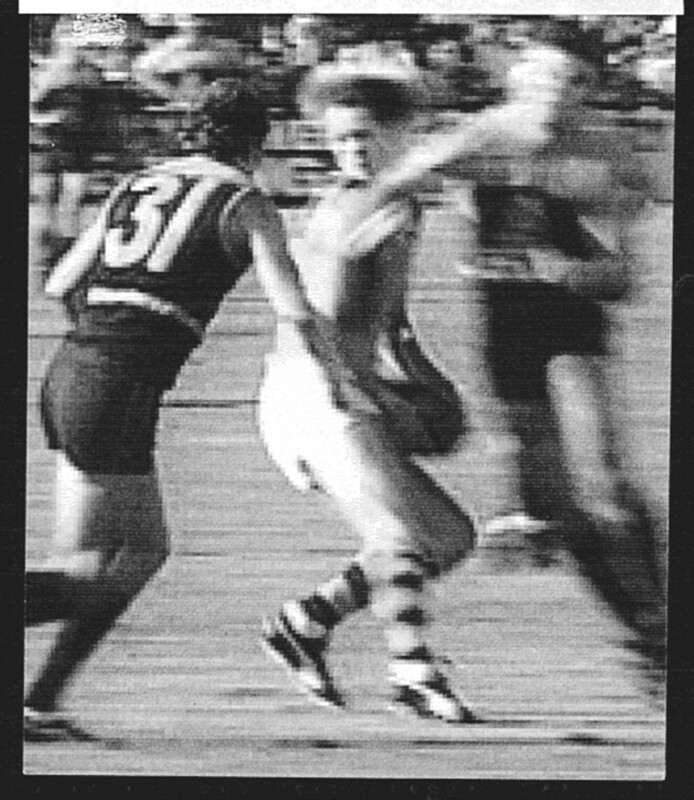 Springfield, Illinois: Charles C Thomas, 1969.
. An objective measure of recovery from concussion in Australian rules footballers. Sport Health 1989;7suppl:6–7).
. Neuropsychological sequelae following concussion in Australian rules footballers. J Clin Exp Neuropsychol 1991;3:439.
. The assessment of orientation following concussion in athletes. Clin J Sports Med 1995;5:32–5).
. Football injuries in Australia at the elite level. Med J Aust 1993;159:298–301).
. Neuropsychological deficits following concussion. Brain Inj (in press).
. A three year survey of Victorian football league injuries. Aust J Sci Med Sport 1992;24:51–4). Gowers WR Epilepsy and the chronic convulsive diseases: their causes, symptoms and treatment.
. The borderland of epilepsy. Faints, vagal attacks, vertigo, migraine, sleep symptoms and their treatment. London: Churchill, 1907:1–17). .Fits and faints. Oxford: MacKeith Press, Blackwell, 1990:41–112).
. Electroencephalographic study of syncope: its differentiation from epilepsy. Lancet 1957;ii:1018–25).
. Syncope. In: Vincken PJ, Bruyn GW, eds. Handbook of clinical neurology. Vol 5. Amsterdam: Elsevier, 1974:815–35).
. Convulsive syncope in blood donors. Ann Neurol 1982;11:525–8). The mess trick and fainting lark. BMJ 1951;ii:382–4).
. Convulsive syncope induced by the Weber manoeuvre. Arch Neurol 1962;7:219–26).
. Electrocerebral accompaniments of syncope associated with malignant ventricular arrhythmias. Ann Intern Med 1988;108:791–6).
. Syncope: a videometric analysis of 56 episodes of transient cerebral hypoxia. Ann Neurol 1994;36:233–7).
. Epileptic seizures: clinical and electrographic features, diagnosis and treatment. Springfield, Illinois: Charles C Thomas, 1972:197–207).